They call it macaroni. Among other things. We live in a city of noodle nuts, wonton worshippers and Pho-natics (really, they meet monthly at Vietnamese pho shops all over town). At cafes, counters and kitchens everywhere, cooks are rolling out the dough — because we can’t get enough of it. Here are some of the places and faces that make ours a United Nations of pasta possibilities. Eric Banh noses his Lexus into a Rainier Valley strip mall, arriving at the Vietnamese cafe and noodle factory Van Loi. He’s after just one thing: banh hoi. Those slender strands of fresh rice vermicelli take a star turn with roasted Carlton Farms pork belly or moist haunches of rotisserie chicken at his new Capitol Hill hangout, Ba Bar. Like Banh (co-owner of Monsoon Vietnamese restaurants in Seattle and Bellevue), the extended family behind Rainier Valley’s noodle-making outfit are natives of Vietnam. “Making banh hoi is a lost art. It’s backbreaking,” Banh says of the job his countrymen do. Their work begins at 4 a.m. when owner Xuan Huynh’s son, Vinh Long, arrives. Sacks of rice, soaked overnight, are ground and extruded through a hydraulic press. Layered into sheets of minute strands, they’re packaged by hand and sold for $3 a pound. 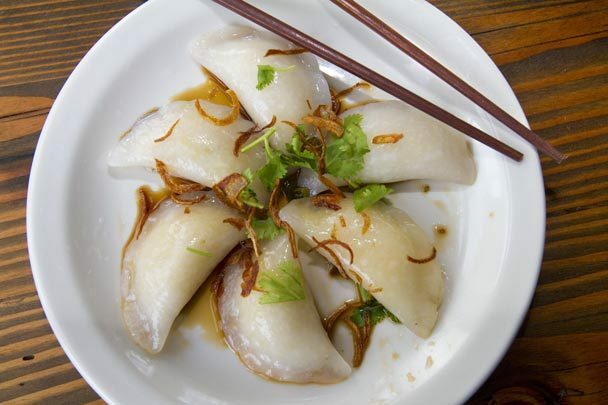 No less revered are the Hue dumplings prepared by hand at Ba Bar, where “Auntie Lan” Nguyen spends the day creating hundreds of translucent crescents out of rice flour and tapioca starch, a task she learned from her mother. Spoon in hand, she stuffs the pliant dough with a dried-mung-bean mixture, then deftly crimps the edges of each little moon. They’ll be served with caramelized shallots in a spicy soy vinaigrette. Offering the gift of food comes easily to the mother of five. As do her tears as she recalls the years her father and husband spent in prison after the fall of Saigon, and the too few prison visits — gifts of food in hand — allowed her. “When I think of my father and my husband, so hungry,” she says, her fingers toying with the cross around her neck. “I teach my children not to waste food, and to always share something. America opened their arms to our family,” she says. In return, she feeds us. 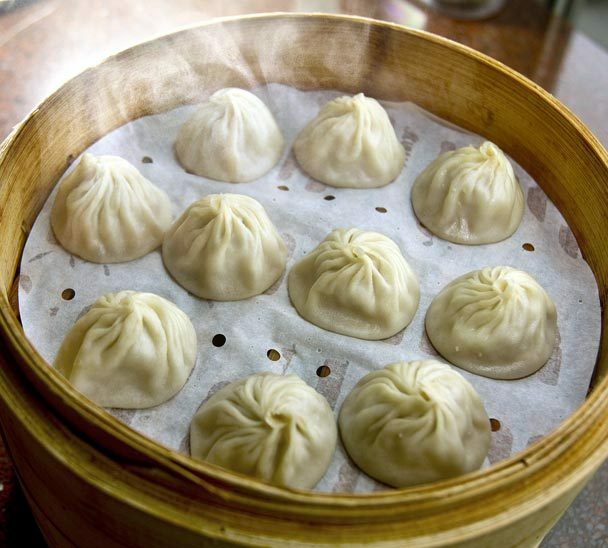 Din Tai Fung, the dynamic dumpling chain founded in Taipei in 1958, opened its first U.S. franchise a year ago in Bellevue’s Lincoln Square. The reaction? Insanity. These days the house is ready for the throng, thanks to an army of fleet-fingered Latinos schooled in the Asian art of xiao long bao, shao mai, wontons and other dumpling-craft. 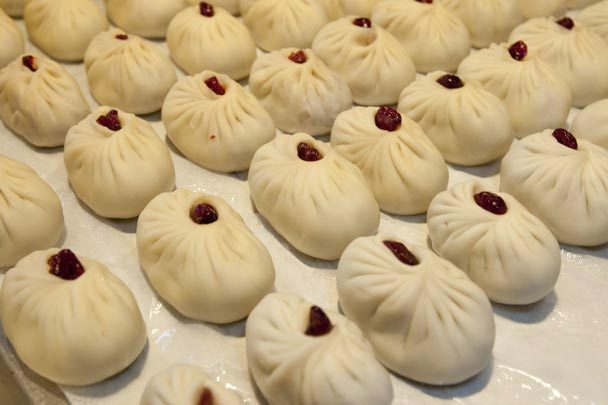 In this first year, the crew has handled mountains of delicate xiao long bao, the signature “juicy pork dumplings” sold by the 10-piece basket. They produce 1,000 steamer-baskets a day on busy weekends. Yes, there’s a big kitchen in back, where cooks fry pork chops, wok mustard greens and make some of the best hot and sour soup you’ll ever eat, but the real show is in the glass-enclosed dumpling domain at the restaurant’s entrance. “They don’t make them like they used to,” says Mike Easton, caressing the 80-year-old cast-iron cavatelli-maker he scored on eBay. 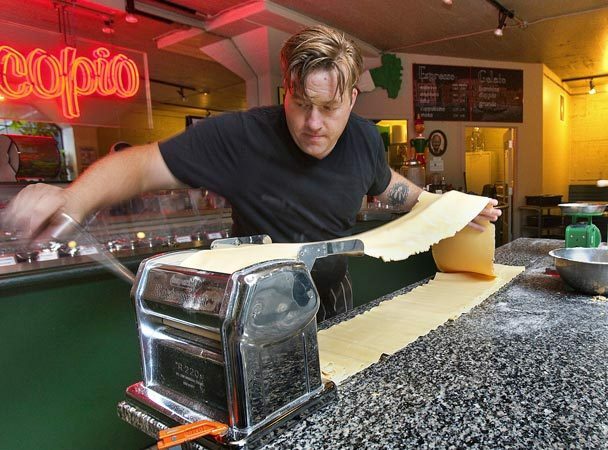 His passion for it is one of the reasons Seattle loves Il Corvo. This isn’t your nonno’s pasta shop. But it could be — if your grandfather was a 37-year-old, clog-wearing chef who gave up the big time for a 20-seat, weekday-lunch hideaway sharing space with Procopio Gelateria on the Pike Street Hillclimb. “Ten years ago, I was assured that the only way to be happy in your career is if everyone knew your name and went to your restaurant,” says the pastaman. Today happiness is showing up at 6 a.m. to make just three types of pasta each day and seasonal sauces to match: that cavatelli, say, paired with a neighbor’s harvest of tombetta squash in summer, or tinted saffron-gold and tossed with cauliflower, garlic and chilies, come fall. It’s serving lunch to Slow Foodies crazy for his house-made pancetta crudo, and turning neophytes on to squid-ink linguine whose “salsa apicus” features house-cured smelt. But long before the chef opens the doors for lunch, he pulls himself an Americano and checks the freezer to see what’s left over from yesterday. (“The best thing you can do to fresh pasta is store it frozen,” he insists.) At the stove in back he slices stubby chanterelles, minces shallots, adds a hit of white-wine vinegar. There’s a quick trip to Frank’s Quality Produce upstairs in the Pike Place Market for the “seconds” he’ll use to create his sauces: those misshapen chanterelles or some gently bruised eggplant. “Everyone wants to hear you’re serving local and organic and communing with farmers,” Easton says. Instead, he communes with customers who pay $8 for a plate of lusty pasta they’ll be dreaming about later. Before opening Il Corvo (the Crow) in May, “I told myself, I’m going to make small batches of handmade pasta, and if I run out, I run out. 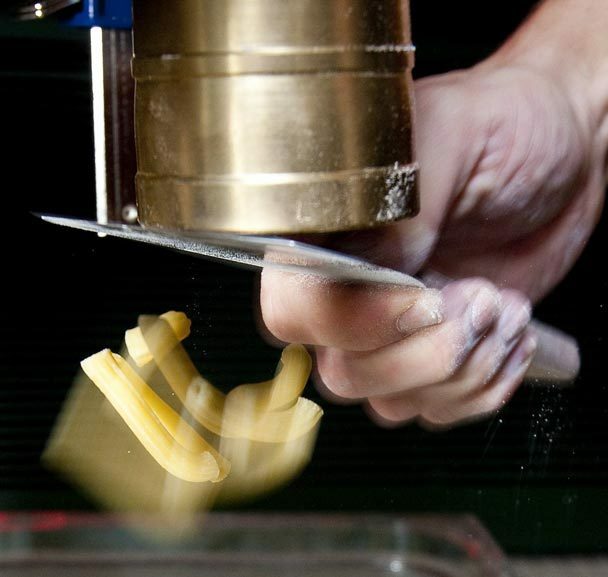 That’s the goal,” he says, feeding sheets of egg-scented dough through his Imperia pasta machine until it “looks like linen.” He cuts it into ribbons on the granite slab that doubles as a communal dining table and pinches pieces into farfalle. Growing up in Guangdon province, Cantonese tofu-maker Yong Huang ate tofu. But tofu noodles? “We never heard of tofu noodles,” says his sister, Lisa Li. You likely never heard of them, either. Unless you’re a tofu fancier like the folks crowding the inner sanctum of Northwest Tofu — a factory, retail shop and Chinese cafe in the Central District. In the cafe, those lightweight noodles are served as a simple, carrot-strewn salad and a popular takeout item, or better still, twisted into knots and floated with five-spiced tofu and mushrooms in a winter-worthy stew made by the siblings’ uncle. Tofu stew — afloat with fresh tofu and thick-cut tofu noodles, available in the cafe at Northwest Tofu. Huang and Li were teens when they arrived in Seattle, joining their mother’s extended family. Now 40, Huang was in his 20s when his culinary education began. Their mother’s friend owned a small tofu factory. Knowing nothing about making tofu, they bought the place. Huang would meet his destiny in the spacious tofu shop out back — and it came with a bonus: a master Taiwanese tofu-maker. Huang worked as his apprentice for two more years. He learned fast and eventually developed his own way, his sister says. And those noodles? They’re handcrafted in large, wooden molds, using fine lengths of muslin layered over and over with a thick soy-milk slurry, gently flattened then weighted down till the milk is completely extracted and the cloth imprints its weave into the tofu sheets. “It’s a lot of work,” Huang says. 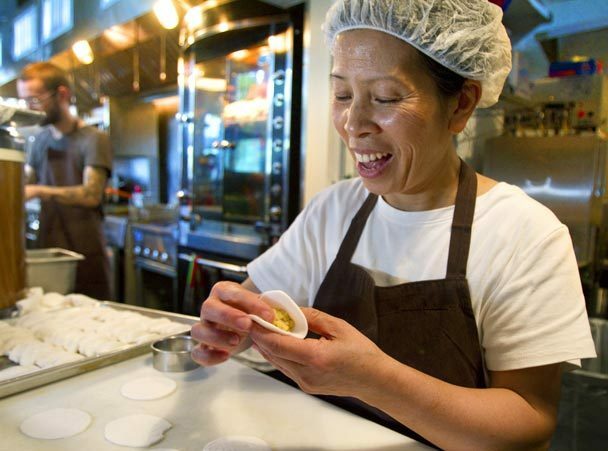 Dekyi Thonden is mistress of the Tibetan dumpling house Ting Momo: the last of three Tom Douglas restaurants to open this year at the refurbished Terry Avenue Building in South Lake Union. A native of Tibet, Dekyi was 10 when her family fled the country, settling in India, where she later married Losang Thonden, the former secretary of the Department of Education for the Dalai Lama’s exiled government. The couple are among an estimated 350 exiled Tibetans in Washington state. Losang came here first with their eldest son in 1992. Dekyi followed five years later with their youngest — after selling the tiny Tibetan restaurant she owned for a decade. 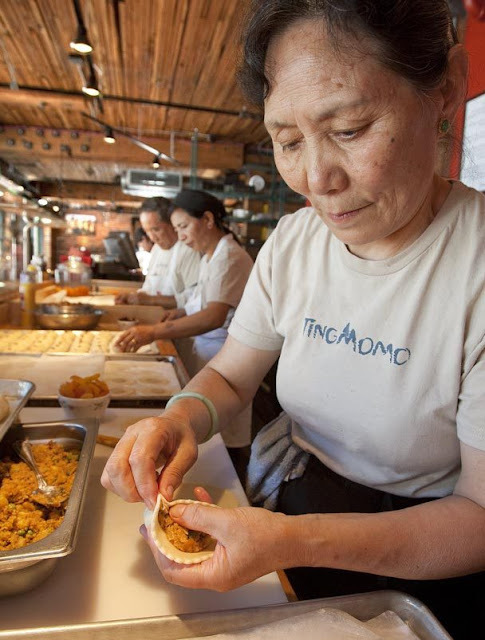 You’ll find Losang at Ting Momo, too, where he makes the doughs used to create the steamed and fried dumplings and noodle-based soups that anchor their brief lunch menu. You’ll also find a crowd of Amazon office-wonks who treat this hip cafe as their exotic cafeteria, checking their smartphones as the Thondens and their crew fill buttery momo pastry twists with ground yak meat (to be fried), or gather noodle dough around pork or vegetarian samos crowned with a dried cranberry and steamed. “Before I left India,” recalls Dekyi, “a friend said, ‘When you’re looking for work in the U.S., never tell them you’re a very good chef. If you do, you won’t get a job,’ ” Hired as a prep cook at the Palace Kitchen 15 years ago, she heeded his advice, happy to cut vegetables until she stepped in one day to expertly filet a whole salmon, and bettered the boss’ recipe for pot stickers. Next thing you know, she was crowned pot-sticker queen at the Dahlia Lounge and making Tibetan street foods for the company’s catered events. “Dekyi has always wanted to open her own place,” Douglas says. When he leased the big brick building where Ting Momo shares a larger production kitchen with his bustling Brave Horse Tavern, he gave her that opportunity. Hours are brief here — 11 a.m. to 2 p.m. Monday through Friday — but Tibetans find time to stop in, some in flowing robes, their spoons delving into bowls of thenthuk — a stunning soup whose toothsome, hand-pulled noodles and gingery coconut broth come infused with fresh-ground “Dekyi spice.” Not yet sold under the Tom Douglas “Rub with Love” label, it’s an aromatherapeutic reminder of a country they never expect to see again.